FUJIFILM announced today that it is introducing new firmware Ver. 4.00 for the X-T1 and X-T1 Graphite Silver Edition cameras that will feature nine key changes aimed at substantially improving the AF performance and operation. - 77 autofocus points are used across a wider area to substantially improve the camera’s ability to capture moving subjects. - Zone mode allows users to choose a 3x3, 5x3 or 5x5 zone from the 77-point AF area. - When combined with the AF-C continuous focusing mode, the camera tracks a subject in the centre of the selected zone. - Wide / Tracking mode displays the area in focus identified automatically out of the 77-point AF area, and tracks the subject across the entire 77-point AF area. Focus can be maintained on subjects that move vertically, horizontally, or back and forth. - Single point AF divides the focus area into smaller sections to more accurately determine the distance to the subject. - Built-in phase detection pixels now have a detection range of 0.5EV (previously 2.5EV), delivering phase detection AF performance that enables fast focus in low light conditions and on low-contrast subjects. - By activating Face Detection AF and Eye Detection AF, the camera automatically detects and focuses on human eyes even in difficult conditions. - This feature eliminates the need to press the Macro button before shooting close-ups, while maintaining the conventional AF speed, allowing the user to assign a different function for the macro button. - The optimised algorithm delivers a more natural and smooth AF action during movie recording. When the Shutter Speed Dial is set to T and the Shutter Type to Mechanical + Electronic, the command dial can be set to a full range of exposure times from 30 - 1/32000 seconds enabling you to change the shutter speed across a broader range without having to change camera position. This is useful when shooting in portrait orientation with the optional Vertical Battery Grip. The lines on the framing grid, which can be displayed in the Screen Set-Up menu, are now finer making it easier to view the subject. The Silent mode has been renamed to “SOUND & FLASH OFF” to avoid confusion. FUJIFILM Australia Product and Marketing Manager - Electronic Imaging, Alex Zitser, said the nine key changes are a reflection of feedback from users. 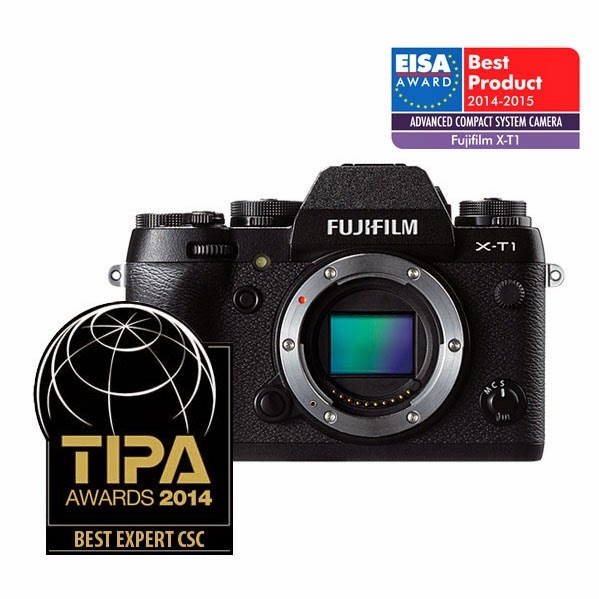 “This demonstrates that Fujifilm continues to listen to customer feedback to boost the performance of X Series cameras. In particular, Fujifilm has taken the ability to capture moving subjects to a whole new level,” Mr Zitser said. The new X-T1 firmware Ver.4.00 will be available from late June 2015.